Fast-drying India ink ideal for drawing, Sumi-E, calligraphy and more! This fast-drying, permanent, deep black India ink is perfect for detailed works and gestural strokes, and while wet cleans up with just soap and water. Use SoHo India Ink for Sumi-E and Chinese calligraphy, for dip-pen drawing and comic book inking, for calligraphy on invitations and cards, for tonal under paintings and quick gestural sketches, or thin with water for use in airbrushes and fountain pens. The deep black ink thins beautifully with water into shades of grey and dries to a rich, permanent finish. 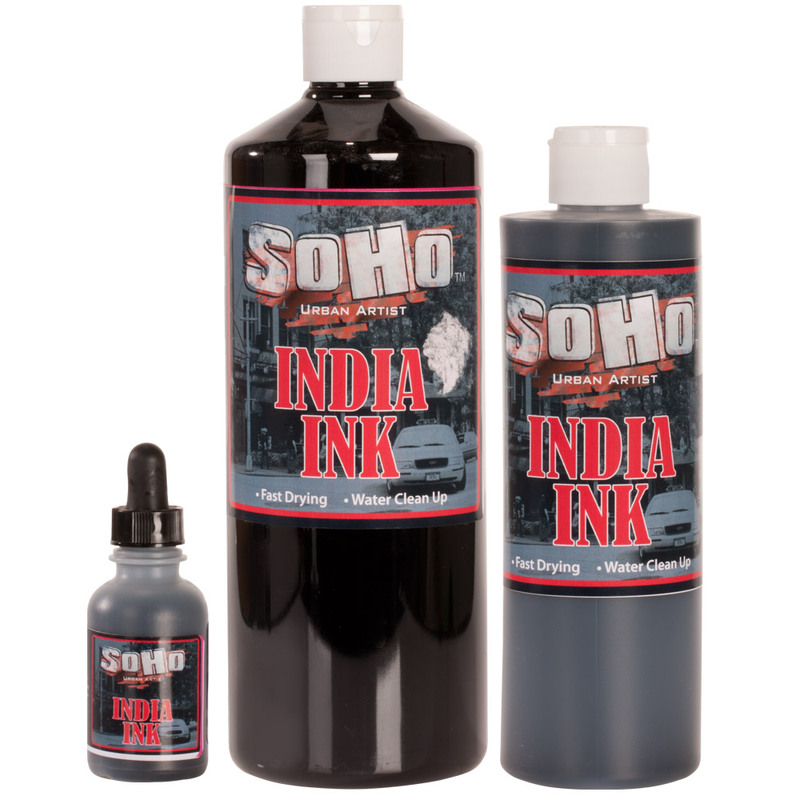 India ink is a staple in any artists' supply arsenal, and now SoHo offers this high quality ink at incredible savings! New SoHo Urban Artist India Ink is a versatile and indispensable medium for nearly any visual artist! This fast-drying, permanent, deep black India ink is perfect for detailed works and gestural strokes, and while wet cleans up with just soap and water. Use SoHo India Ink for Sumi-E and Chinese calligraphy, for dip-pen drawing and comic book inking, for calligraphy on invitations and cards, for tonal under paintings and quick gestural sketches, or thin with water for use in airbrushes and fountain pens. The deep black ink thins beautifully with water into shades of grey and dries to a rich, permanent finish. India ink is a staple in any artists' supply arsenal, and now SoHo offers this high quality ink at incredible savings! SoHo Urban Artist India Ink is rated 5.0 out of 5 by 1. Rated 5 out of 5 by JR421 from This ink is good! I first purchased the two ounce bottle of the Soho India ink about three to four weeks, and I like this even better the acrylic ink that I used before! The washes can be used with or like watercolors paints. You can build it up in layers. Finally, it's very affordable! I'll buy it again. Yes, the ink is permanent. Please let us know if you have any other questions or concerns. This product is not designed to be used for tattoos. I would strongly urge you to use an ink that is approved for tattoo application and is skin safe. We do sell a body art transfer paper product here https://www.jerrysartarama.com/brands/jacquard/jaquard-spirit-body-art-transfer-paper and we also carry Hena products that can be used on human skin safely https://www.jerrysartarama.com/jacquard-henna-and-kits. Please let us know if you have any other questions or concerns. Is this Ink ok in tech pens? If you thin the ink with water you can use it in a fountain pen. If you are interested in using a technical pen that is refillable we have a waterproof ink that is designed for that type of pen https://www.jerrysartarama.com/isomars-technoart-pen-sets Please let us know if you have any other questions or concerns. Basic India ink is composed of a variety of fine soot known as lampblack, combined with water to form a liquid. A binding agent such as gelatin or, more commonly, shellac may be added to make the ink more durable once dried. India ink is occasionally sold in solid form (most commonly, a stick), which must be moistened before use.